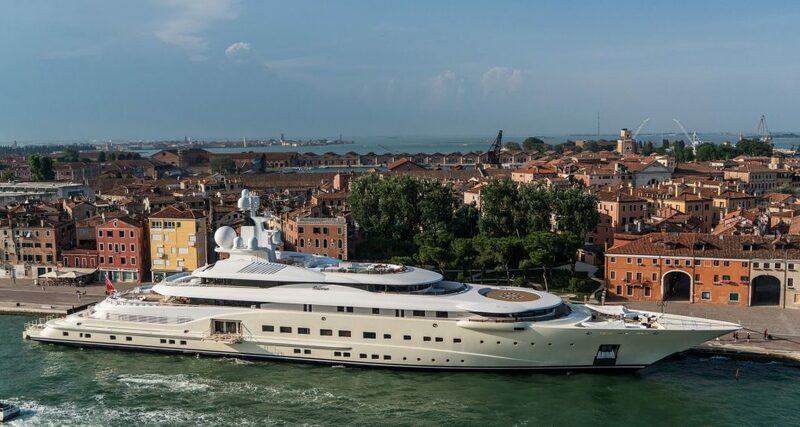 Valued at $124 million, Ambrosia was built by famed Italian company Benetti. Furthermore, the 12-person yacht had its interior designed by French genius Francois Zuretti. Built in 2006, the yacht can travel a maximum speed of 16 knots. 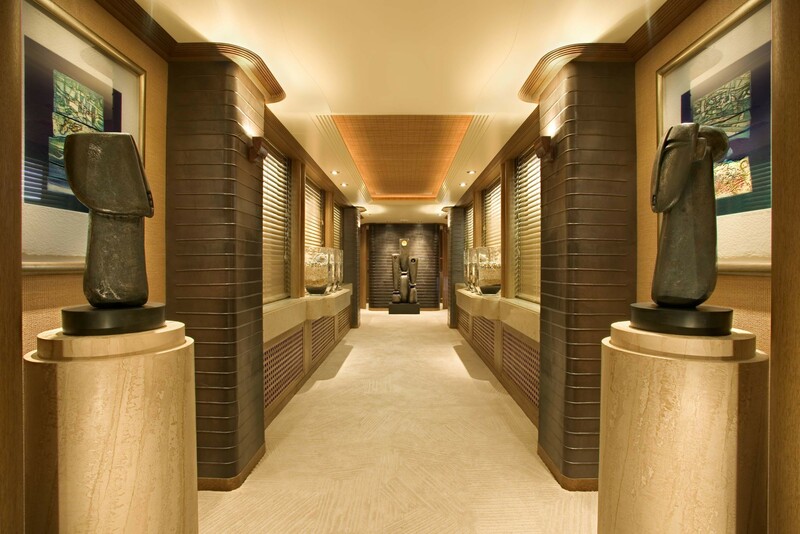 The art-deco inspired interior features state-of-the-art finishes. This includes multiple murals and opulent staircases. As one can see, the dining room showed below exudes both class and sophistication. Tatoosh was formerly owned by Portland Trail Blazers owner Paul Allen. 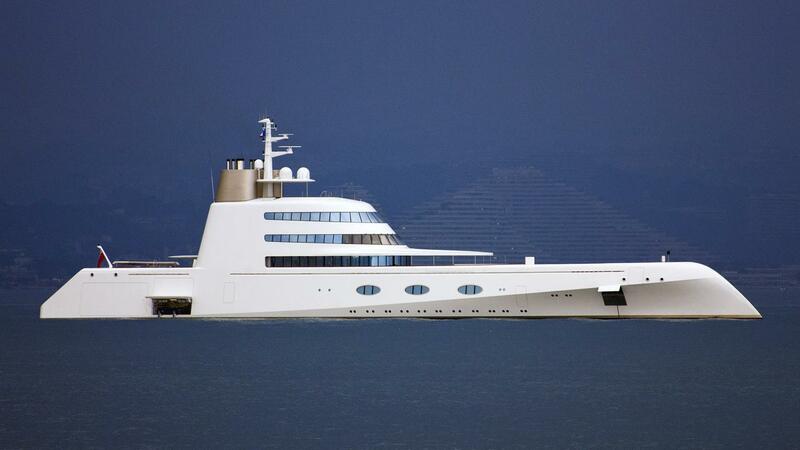 This yacht slight exceeds 300 feet long. 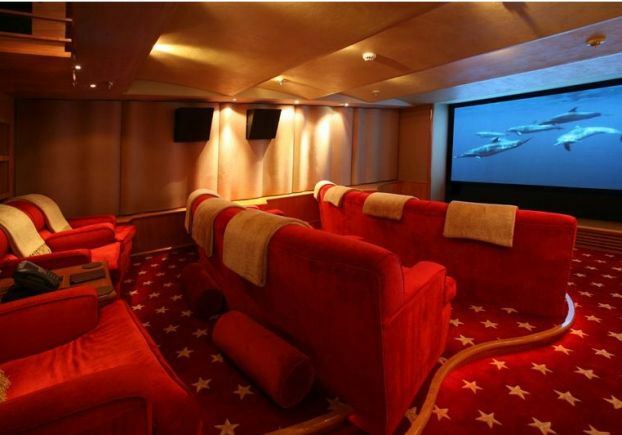 As one can see, it includes a ridiculously nice personal theater. But that’s not all, as Tatoosh also comes equipped with multiple helicopter pads, an indoor swimming pool, nine rooms, a capacity for nearly 60 people, and a basketball court. In other words, any guest on this boat will have no semblance of boredom. Its features are simply ridiculous. TV was created in 2008 by Lürssen, and had its interior designs crafted by Alberto Pinto. It now fully functions as a charter yacht for those who’d like to rent it. It primarily resides in both the west and eastern part of the Mediterranean. In terms of amenities, TV has a jacuzzi big enough to fit 16 people. It also holds a swimming pool, a private upper deck (great for star/sunset/sunrise gazing), a helicopter pad, a full-on barbecue area, and a lavish dining room. This triumph will cost up to nearly $985,000 to charter per week. Built in 2006, Eos is one of the biggest and largest yachts in the entire world. 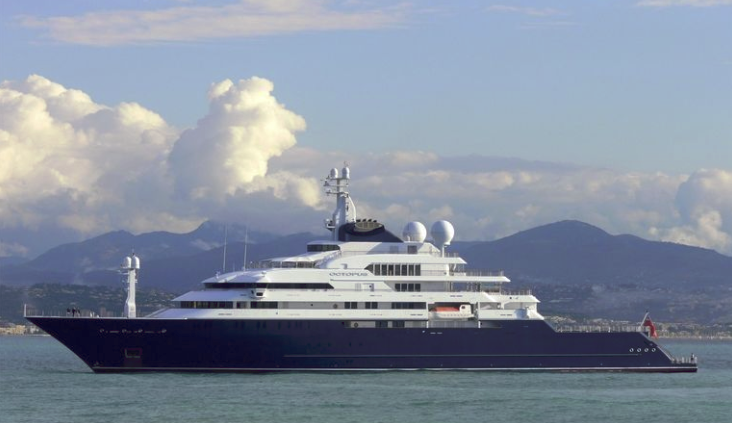 Designed by Lürssen, the boat stretches out to 304 feet-long. Many celebrities have made use of this striking sea craft at one point or another. Eos is based in the Caribbean — and has surely traversed all throughout the crystalline waters of the region. The four large sails help in giving it a very distinct appearance. It’s almost as if this yacht comprises both modern characteristics with traditional sensibilities. This 2005 yacht is simply spectacular. Resembling a powerful aircraft carrier, Ice holds every feature one would ever want in an ideal yacht. 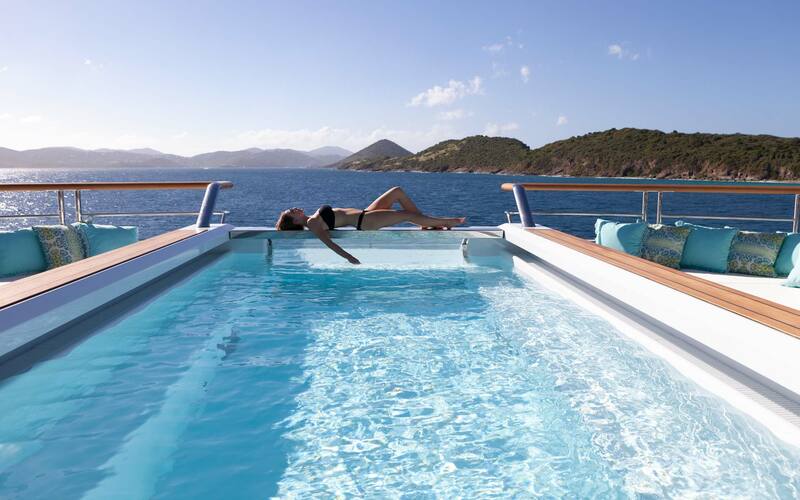 On the front of the boat, a gigantic pool sits for all to enjoy. The thought of relaxing in a fantastic pool whilst looking out at the ocean is a luxury only few can take in. Ice is the first yacht in existence to come equipped with Azipods. A multitude of diesel generations power the boat. This combination allows for the boat to operate with vibrations — thus offering a premium experience for all traveling on the yacht. Lionheart looks like a yacht doubling as a high-end resort. The sheer size of the boat is beyond impressive. One look at the photo above offers a strong glimpse into Lionheart’s majesty. The yacht itself was constructed out of steel and aluminum. It has three elevators located inside in order to transport patrons from floor to floor. It also has a helicopter pad, a large swimming pool, and lavish accommodations for up to 12 people. 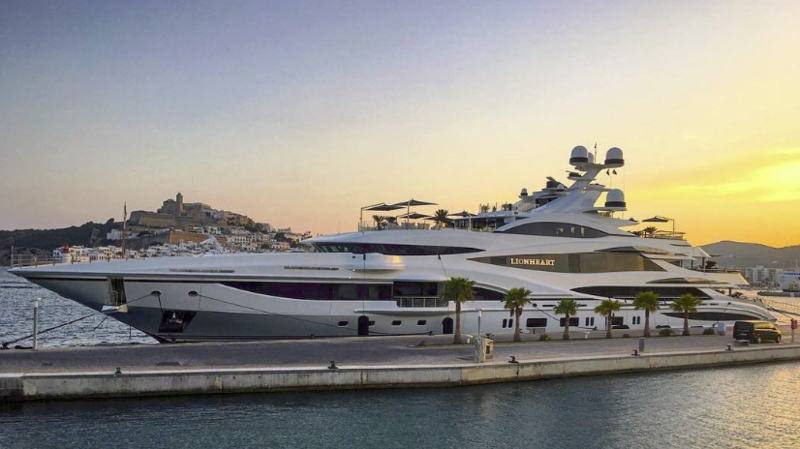 The yacht is owned by Sir Philip Green — the famed clothing retail entrepreneur. 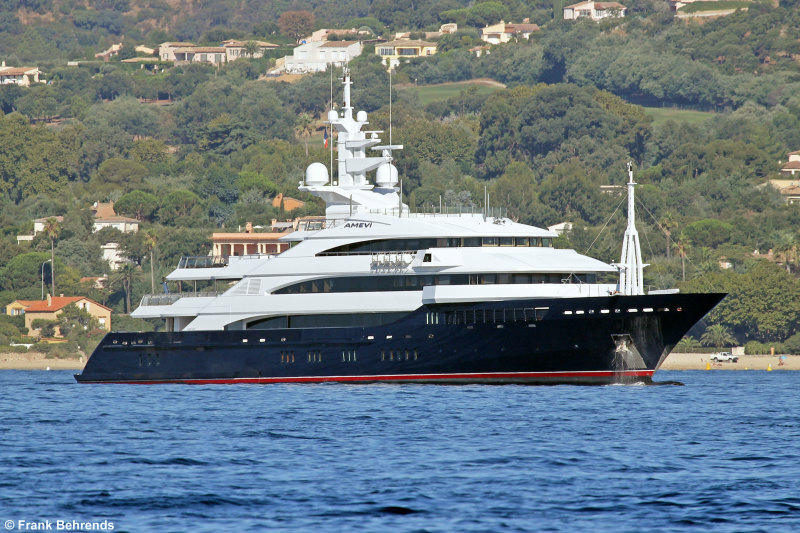 Stretching 80 meters in length, Amevi was first constructed by Dutch company Oceanco. If one ever wants to charter a yacht for a large group of people, Amevi may be the ticket. 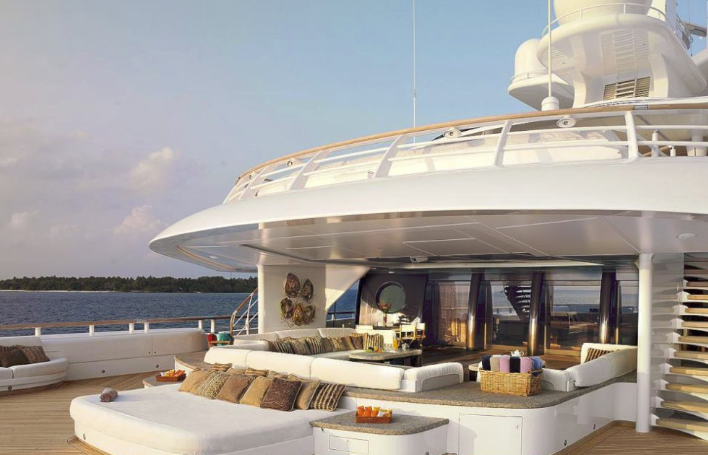 The yacht has eight separate compartments for up to 16 guests. This doesn’t even include the 32 crew members that will be dispersed throughout the boat. 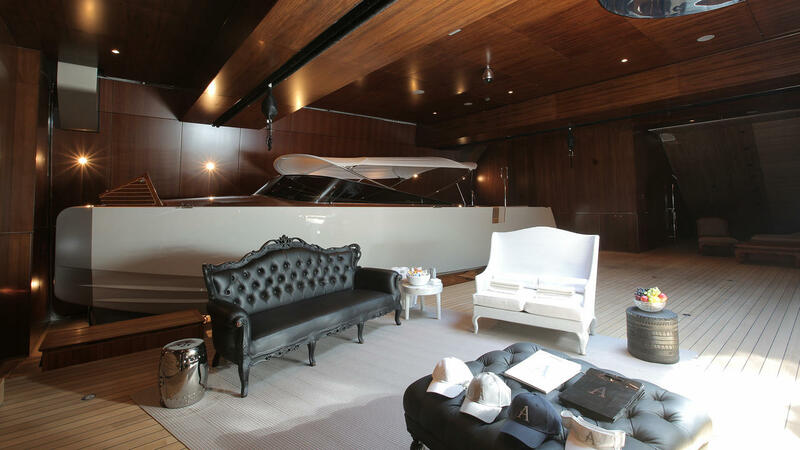 Within the inside of the yacht, guests can enjoy a large elevator, a swimming pool, and a gym. Amevi even includes a helicopter pad and a deck-side jacuzzi. One will surely be traveling in style aboard this magnificent yacht. For the Maltese Falcon, opulence is the name of the game. 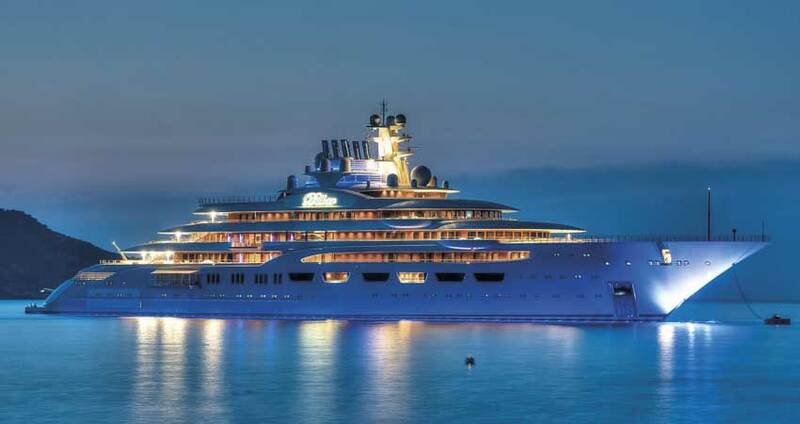 This $157 million-dollar yacht is insanely exquisite. One look at the dining room inside the interior cabin will have you thinking you’re at a five-star restaurant in Las Vegas. Built in Istanbul, the sails employed by this yacht were meticulously crafted over a three-year span. A multitude of celebrities have used this ship over the years. 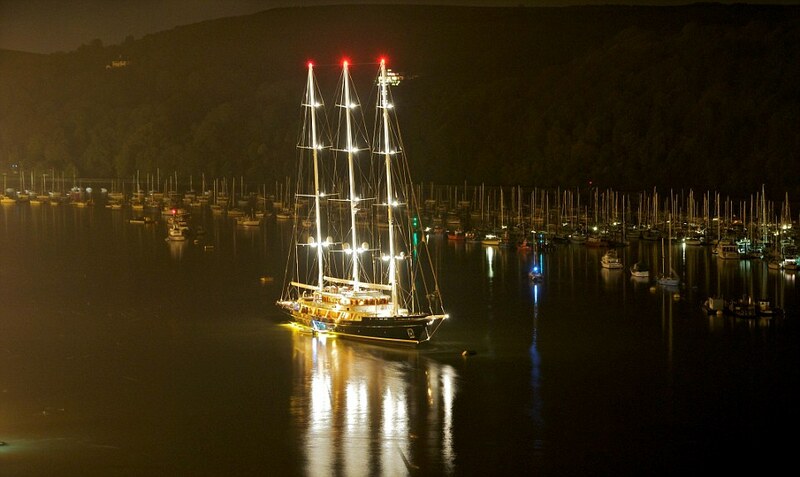 Unsurprisingly, it’s widely regarded as one of the most beautiful yachts in the world. Solandge was built back in 2013. The tiered levels of this boat are clearly depicted through these visuals. In its totality, it can hold upwards of 40 people (crew and guests) quite comfortably. Within the cabin of the boat exists a gigantic elevator, a full spa/massage room, multiple hot tubs, an ornate wine cellar, a handful of sunbathing decks, and a private sunbathing deck (which can be seen below). There’s even a dance floor fashioned right near the world-class dining room. As one can see, Solandge is simply breathtaking. 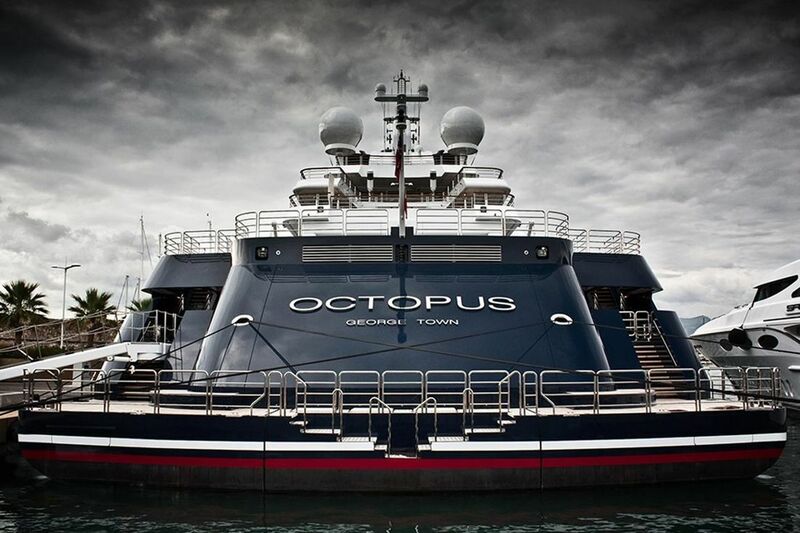 This yacht — called Octopus — resembles a cargo shipping boat more so than a luxury vessel. It speaks directly to its gigantic frame. 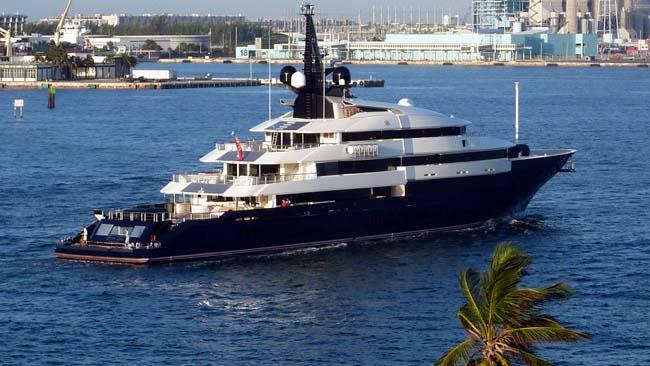 Owned by Portland Trail Blazers/Microsoft founder, Paul Allen, the yacht is a multi-purpose entity. For one, it’s steeped in unadulterated class. The 414-foot boat has every trait one would look for in a luxury seacraft. However, it’s also used for scientific purposes — particularly when exploring old wrecks under water. Octopus has led to the discovery of multiple wrecks, including the famed Japanese battleship Musashi. 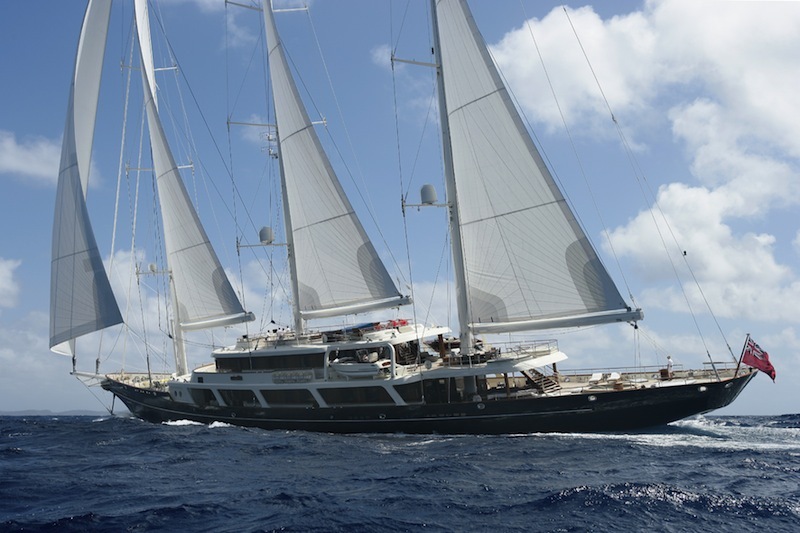 Also situated primarily in the Caribbean, Ecstasea is one of the world’s leading yachts. Aesthetically, it looks both powerful and sleek. When venturing inside the cabin, the level of luxury is increased even further. Hues of brown and gold are littered throughout the interior. This includes the finest in leather, updated fixtures, and opulent touches. Performance wise, Ecstasea can power up to an impressive 30 knots on the open water. When cruising in absolute style, very few can compare to this beauty. Belonging to Saudi Arabian royalty, Al Salamah was built to absolutely ‘wow’ people. This yacht (built in 1999) registers at a whopping 457 feet — thus making it one of the largest yachts in the world. 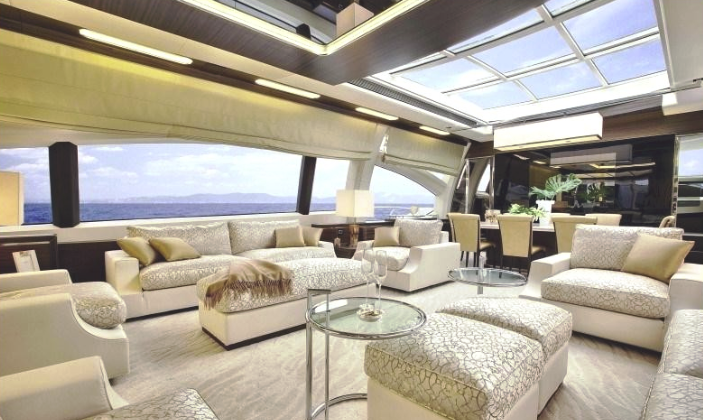 The interior of the boat is just as striking. As one can see from the photo below, one of the main cabins is akin to a palace of the highest order. Possessing the highest quality was clearly a motivating factor when crafting this vessel. Among other amenities, the interior of the boat includes a movie theater, a library, a fully-equipped gym, and its own hospital. Perhaps most impressive, the water tanks within the performance center of the boat can store up to 430,000 liters of fresh water. Rising Sun nearly rivals Al Salamah in terms of boat length. Built in 2004, this powerful yacht can travel up to 30 knots. The main dining room is spectacular — as it offers tremendous views gazing out over the ocean. 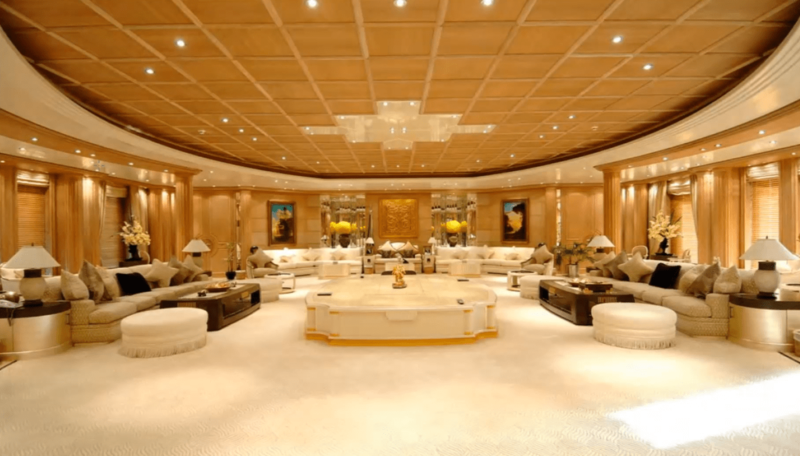 Crazily enough, the boat has an eye-popping 82 rooms (over five tiers). It has many of the usual amenities one would look for in a luxury seacraft (swimming pools, cinema, a full gym, elevator). However, it also comes with a basketball court. One has to wonder if any past/present NBA players rented out Rising Sun for their own personal use. Seven Seas has been a known commodity for quite some time. It was previously owned by Hollywood’s most famous director, Steven Spielberg. The 12-person yacht is considerably impressive. An infinity pool is accentuated further by a gigantic movie screen, a helicopter pad, a gym, and a massage room. The infinity pool is particularly special due to its versatility — as it can be transformed seamlessly into both a helicopter pad and a space for entertainment. The interior finishes include a plethora of high-end materials — including rosewood and walnut. Crafted by German builder Blohm + Voss, Lady Moura is one of the largest yachts on the planet. Its traditional yet bright construction makes it an attention-grabber whenever out on the ocean. 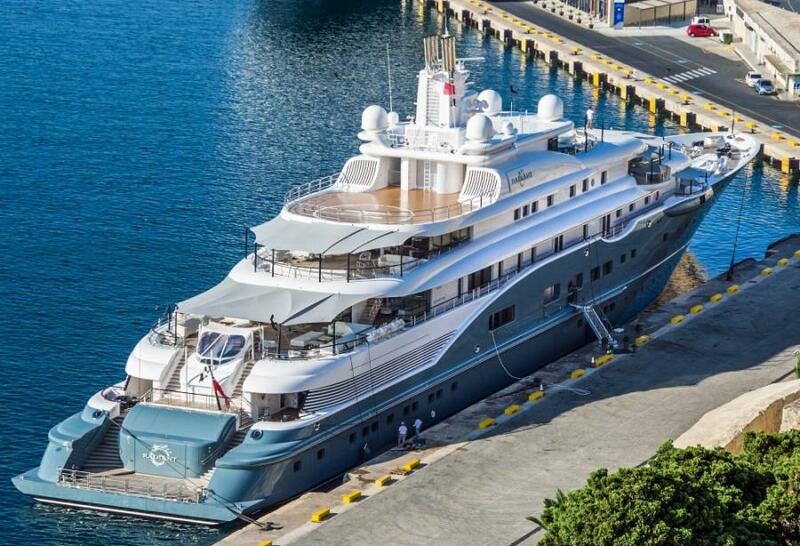 It’s privately owned by famed entrepreneur Nasser Al-Rashid. As such, it’s garnered quite a bit of praise from fellow celebrities who’ve traveled on its steel-based frame. It travels at a respectable 20 knots whilst out at sea. In addition, Lady Moura was transcendent for her time. When built in 1990, no one had ever seen a yacht with this assortment of fun qualities. One in particular which has people in a tizzy is Lady Moura’s retractable roof. 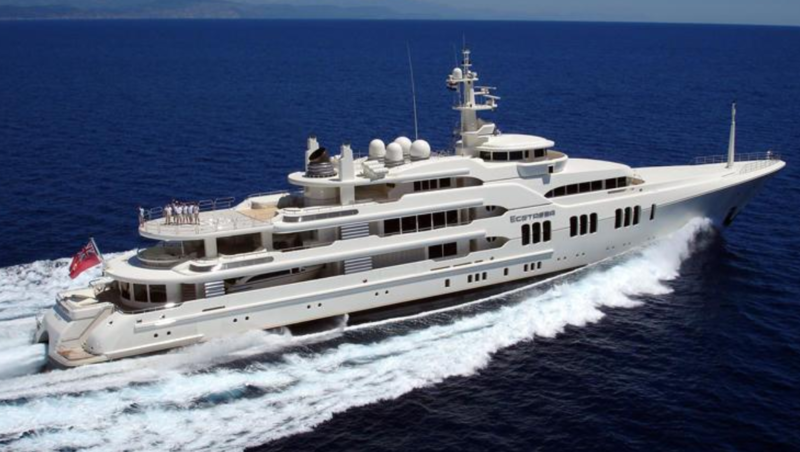 There’s your average every-day motor yacht… and then there’s Al Mirqab. This yacht is a giant — literally and figuratively — within the motor yacht industry. It stretches beyond 430 feet long, thus giving off vibes of power and authority. The interior of the boat caters solely to the needs of the guests on board. Each suite (there are 10 available) comes with their own living rooms and bathrooms. After freshening up, guests can enjoy activities such as swimming in the indoor pool or taking in a film at the movie theater. Ding Ding! We’ve found a winner! Dilbar — owned by Russian billionaire Alisher Usmanov — is the world’s largest yacht in terms of volume. 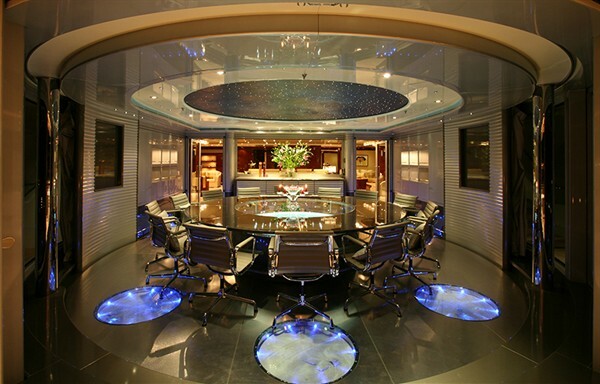 There are estimations in which this yacht has 20 cabins strictly for guests. There’s an inordinate amount of cabling within the framework of this boat? How much, you ask? Well, when stretched out vertically, the amount of cable (683 miles) is longer than the distance between the most southern part of France to its most northern part. This yacht almost resembles that of a birthday cake. Layered tiers are neatly crafted. This offers the boat more depth, and thus gives off more of a grand impression. Radiant was first built in 2009. It had the name of Darius before garnering its newer name. 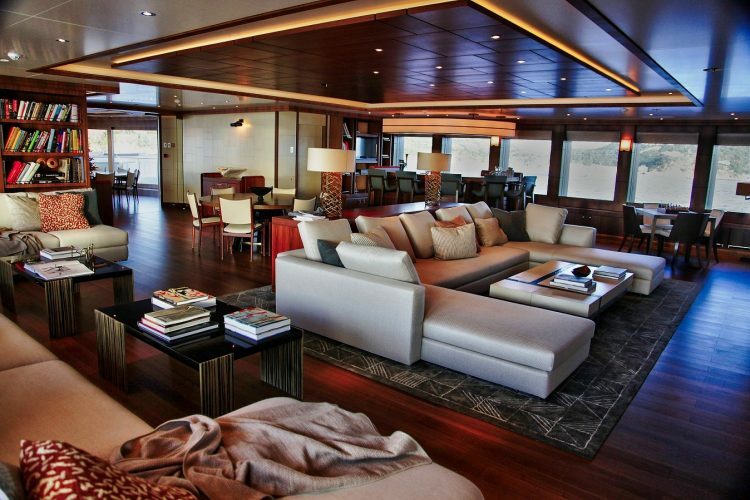 The 20-guest yacht is buoyed by a steel hull, teak decking (there are five of them), and an aluminum superstructure. Impressively, it can reach speeds up to 21 knots. Pelorus is a stunner. Lounging delicately in Bermuda, it’s owned by Sheikh Abdullah bin Zayed Al Nahyan — the son of UAE founder Zayed bin Sultan Al Nahyan. Unsurprisingly, Pelorus has the very best in virtually every category. 11 cabins are situated solely for the convenience of guests. Within the cabin, there are elevators, jacuzzis, a pool, a spa, a gym, a cinema, and even a dance floor. On the back deck, a beautiful lounging area (shown above) exists for those who want to enjoy the sunrise/sunset. 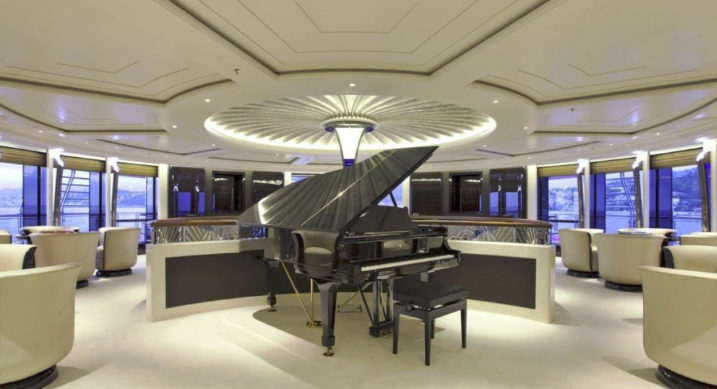 How many yachts feature a baby grand piano in the middle of its interior cabin? To put it bluntly, not many. 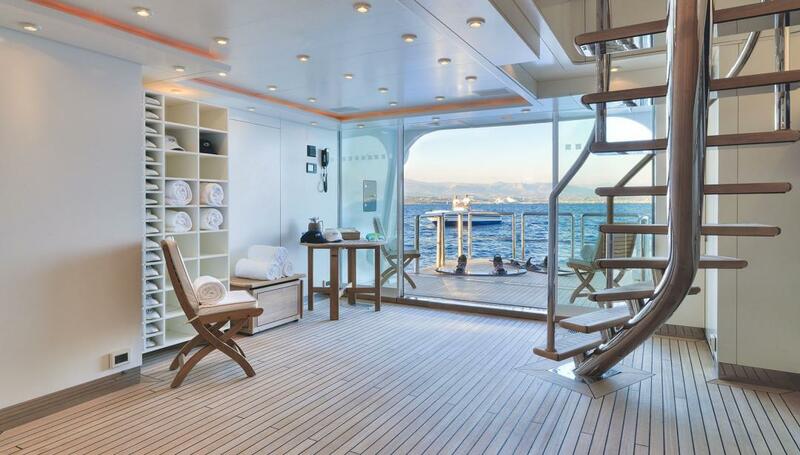 Serene is a brilliantly constructed yacht. It’s large enough to hold upwards of 50 people comfortably. A bird’s-eye view of the ship shows a gigantic outdoor jacuzzi sitting neatly on the top deck. This is perfect for star gazing or sunset viewing. Duly, there’s an indoor saltwater pool to simulate the feel of swimming in the ocean without the looming threat of a shark or any other dangerous creature. 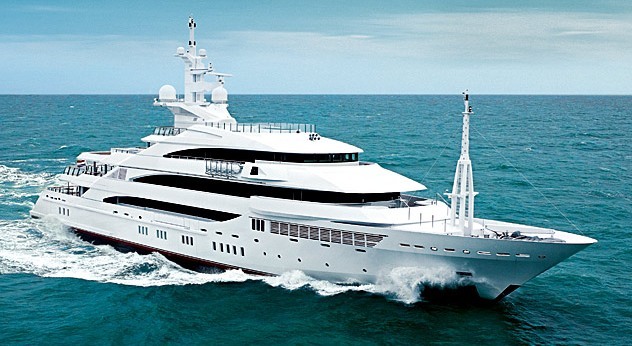 Al Said is one of the five most beautiful yachts in the entire world. It has the look of a regal warship upon first glance. Bold and brazen, this beauty glides on the water effortlessly. Listed at over 500 feet long, it’s also one of the longest yachts known to man. 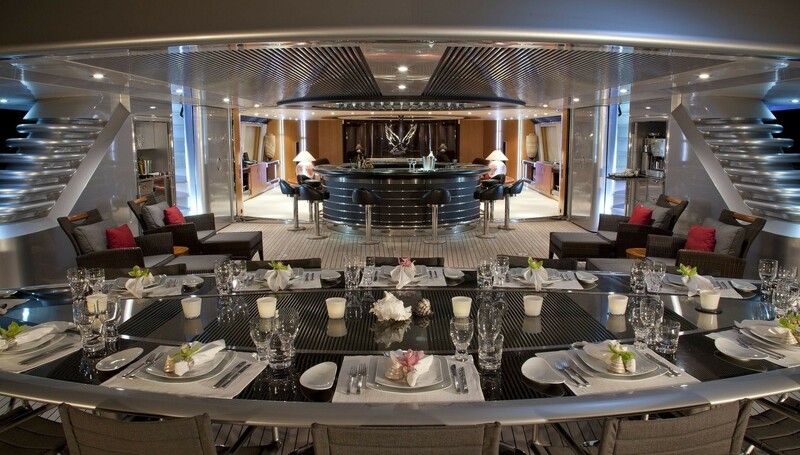 With its grand size, it comes as no surprise that Al Said can hold 70 guests and up to 150 crew members. As one can see below, this suite is something out of a royal palace. Dubai is a large boat. By large, we mean 531 feet of aluminum and steel working in unison to form a spectacular yacht. Interestingly enough, this project went through a number of alterations before evolving into this current model. It previously held other names (Panhandle, Golden Star, Platinum) before landing on Dubai. 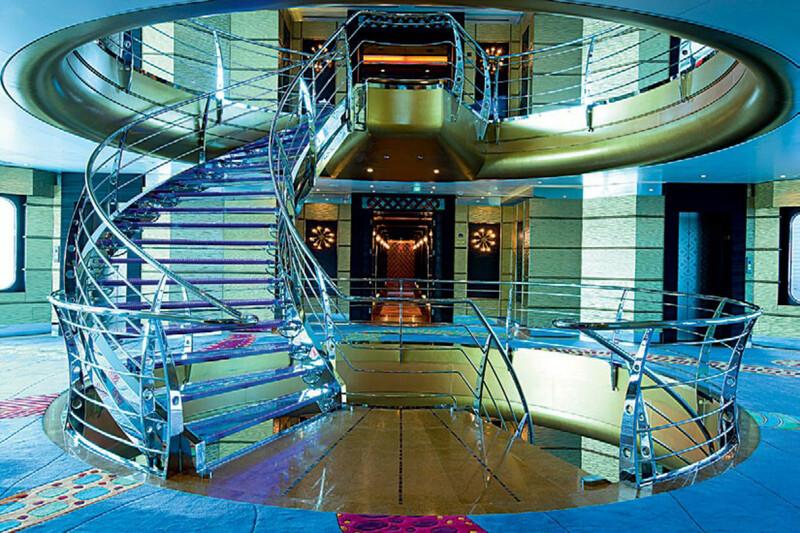 The sparkling staircase (shown below) has the ability to change color depending upon the amount of natural light beaming down from the top deck. There are multiple jacuzzis within the yacht. However, the most striking feature may be a private pool fashioned with mosaic tiling. Motor Yacht A has a truly dynamic appearance. In essence, it looks like a massive submarine primed to drop deep into the depths of the ocean at a moment’s notice. Built in 2008, A was carefully crafted by famed developer Philippe Starck. There are rumors Starck designed the ship in only two hours. Whether that’s true or not, it remains a true triumph in the world of yachts. The main cabin of the ship bears resemblance to a virtual throne room. Without question, this yacht succeeded in breaking the typical mold. 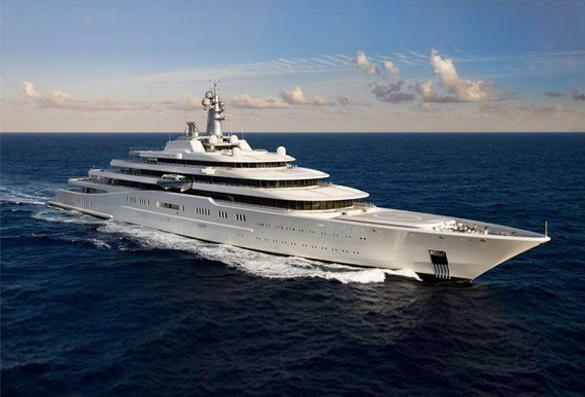 Azzam is the largest yacht in the entire world. Registering at nearly 593 feet, this 2013 model surely gets the blood pumping for even the most passionate of yacht enthusiasts. Owned by the President of UAE (Khalifa bin Zayed Al Nahyan), Azzam inexplicably is equipped with its own missile defense system and submarine. 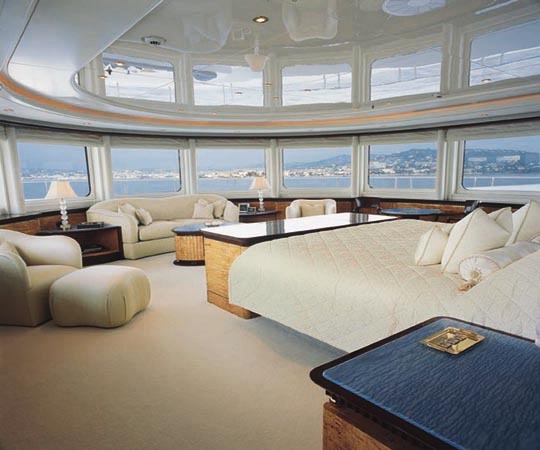 It can keep all guests on board safe whist also offering arguably the most luxurious setting one can imagine. Eclipse is the pinnacle of all yachts worldwide. There’s not another yacht on this planet possessing this level of class, sophistication, and performance capabilities. Much like Azzam, Eclipse also has a security system in the form of a missile detection system, three launch boats, and a mini-submarine. 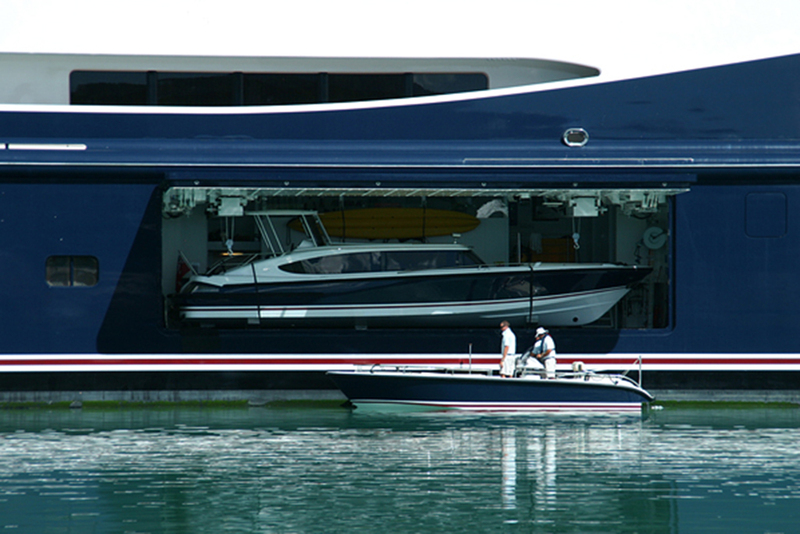 36 guests can easily fit within the framework of the yacht. Some of the ridiculously nice amenities on board include a large tender garage, a helicopter hangar, a full beauty salon, a jacuzzi-pool combination, and a dance floor. 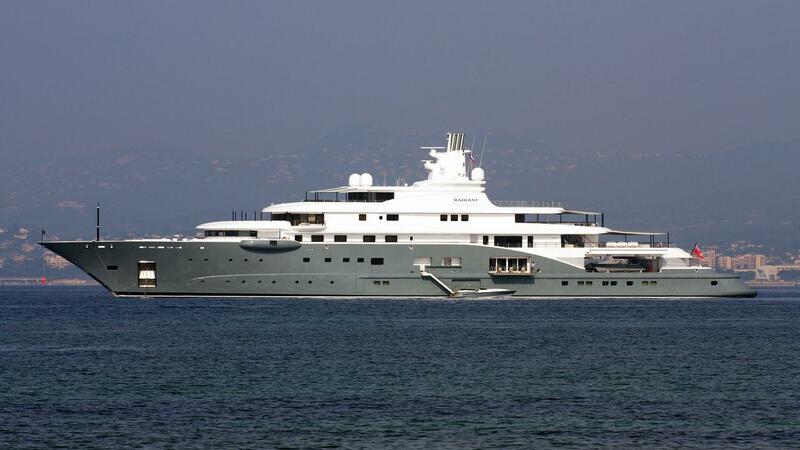 Eclipsed is owned by Russian billionaire (and owner of Chelsea Football Club) Roman Abramovich.